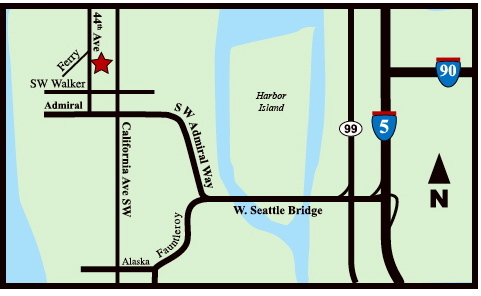 Natural Flow Massage is located in the north end of West Seattle with direct access to major arterials and the freeways. By Seattle Metro bus, take Bus #56 which brings you within 3 blocks. Get off at the intersection of California Ave SW and SW Admiral. Go left onto Walker, then right onto 44th Ave SW.
We're just past the large modern home on the right at 2132 44th Avenue SW.
Look for the wooden driftwood archway at our steps.